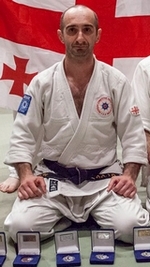 In Georgia Competitive (sport) Aikido was established in 1998 by Vakhtang Sikharulidze. He also founded the Georgian Tomiki Aikido Federation (GTAF). In 1998, 1 October GTAF was acknovedged as the branch-office of the Japan Aikido Association. The special adviser and technical leader is Mr. Kenshi Uno (8th Dan Aikido, 3rd Dan Kendo) from JAAS. On August, 5-10 2003 in Leeds (England) the first time the Georgian representatives, Vakhtang Sikharulidze and Maia Mazanishvili has taken part in the Fifth Aikido World Championship. On 8th August, 2003 GTAF became member of Tomiki Aikido International Network (TAIN). On October 3-5, 2003 by Vakhtang Sikharulidze was held first seminar in Baku. He was invited by Azerbaijan Centre of Real Aikido. It was starting of development Tomiki Aikido in Azerbaijan. On October 26th, 2003 in Tbilisi was held Georgian I Aikido Open Championship in which with Georgian aikidokas took part sportsmen from Azerbaijan. On the first and second European championships Georgian team members become European champions. First time in World Aikido history Georgian Aikidokas had success at the World Championship in Kyoto, 2009. Vakhtang Sikharulidze, Aleksandre Kherodinashvili and Lasha Rostomashvili received bronze medals. On 1st October, 2011 Federation was renamed and now calls Georgian Competitive Aikido Association (GCAA). GCAA is the only organization which develops competitive (sport) Aikido in Georgia. GCAA holds the sportsmen's certification three times a year (March, May, December). Twice a year (May, November) are hold national tournaments.